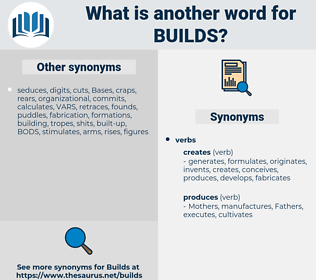 What is another word for builds? reinforces, hails, investigates, determines, identifies, creates, achieves, gold, commends, provides, hits, shall, establish, praises, wins, AERC, develop, create, strengthen, strengthening, Creating. Establishing, development, elaborates, upgrades, formulates, designs, Translations, drafts, layouts, steppings, inspires, collections, premises, prepares, editions, iterations, versions, stakes, Houses, releases, Bets, variants, start-up, charts, seeks, FORMATS, causes, Missions, WORMS, Asses, makes, creates, establish, develop. developing, benefits, works, consolidates, forge, forged, forges, form, Forms, Establishing, enjoys, generates, creation, accelerates, substantiates, stimulated, stimulates, distinguishes, improve, improving, improves, demonstrates, unfolds, upholds, articulates, evaluates, hail, domesticates, underlines, exacerbates, yields, sustains, compiles, enhance, Enhancing, administers, stipulates, deepens, improvement, preparation, intensifies, manufactures, contributes, utilizes, expands, reintroduces, enlarges, holds, organizes, instils, facilitates, underpins, perpetuates, underlies, participates, Has, simulates, progresses, accentuates, fabricates, obtains, underscores, broadens, heightens, invests, replicates, Flourishes, fulfills, fulfils, reaffirm, reaffirms, derives, widens, buttresses, exists, concludes, entertains, undertakes, dovetails, submits, calculates, elicits, classifies, promotes, discusses, indicates, foundation, introduces, summarises, boosts, leverage, leverages, exploited, exploits, collects, gathers, populates, amplifies, entrenches, maximizes, accommodates, bucks, tightens, lauds, outlines, aileges, increments, receives, development, furthers, provokes, augments, disposes, produces, describes, subscribes, mainstreams, represents, advocates, escalates, arouses, highlights, acknowledges, emphasises, attracts, arranges, lays, summarizes, induces, bids, empowers, incurs, reproduces, folds, harbours, applauds, follows, re-enforces, nourishes, explains, nurtures, translates, ensures, recognises, secures, emphasizes, regulates, enables, regains, comprises, occupies, fills, necessitates, destroys, governs, assigns, dictates, understands, concentrates, explores, enriches, reiterates, believes, adheres, belongs, clarifies, grows, renders, informs, dumps, complement, complements, determining, advises, retains, includes, foments, manages, SITS, originates, seizes, bestows, brings, handicaps, stirs, ushers, prolongs, initiates, accompanies, magnifies, justifies, Lends, showcases, Manifests, draws, encourage, encourages, protects, constitutes, leads, authorizes, confirms, appreciates, contains, enshrines, embodies, enrolls, involves, defines, writes, entrusts, implies, unites, pursues, fuels, strives, learns, prescribes, elaborates, breathes, entitles, thrives, enforces, adopts, drains, recognizes, supplements, invokes, comprehensive, asserts, consists, rises, considers, occurs, Leaves, lies, aligns, complete, completes, begets, endorses, feeds, configures, breeds, Institutes, earns, affirms, conducts, incites, launches, creations, Addresses, corresponds, encompasses, handles, is, depends, proceeds, awakens, resides, pushes, emerges, contends, triggers, specifies, settles, confers, evokes, approves, moves, arises, Plays, transposes, spends, insists, employs, enacts, obliges, leaning, leans, begins, declares, affords, responds, results, reflects, assesses, presents, argues, appends, lists, Grants, emits, operates, intends, flows, formulates, awaits, spreads, strike, Strikes, boasts, embraces, evolves, parallels, entails, harvests, repeats, revolves, performs, tailors, assumes, restates, spawns, concurs, Drives, requires, puts, harnesses, tug, continues, designs, sparks, envisages, taps, imposes, support, supporting, supports, raises, reverts, pulls, enrols, feels, shoots, rolls, mirrors, combines, teaches, treaty, directs, conforms, owns, complies, commands, shapes, outputs, tells, Carries, weighs, PAVES, Grips, captures, prompts, tackles, locks, joins, accrues, compliments, examines, features, arrives, adds, Allowing, allows, agrees, throw, throws, looks, sponsors, opens, exposes, uses, helps, registers, drafts, drops, deals, Gives, aims, stays, passes, pits, purports, hosts, vests, tosses, Permits, assists, matches, falls, resumes, fits, inspires, account, accounts, pays, Tracks, proves, fixes, spins, OWES, ranks, stands, relates, stems, hinges, prepares, Focuses, focusses, takes, poses, counts, ties, keeps, melts, founds, casts, enters, ranges, starts, profits, fires, turns, returns, serves, offers, tends, hears, Comes, fond, covers, places, favors, wishes, says, Bears, runs, table, tables, spurs, change, changes, Backs, echoes, sees, Rests, refers, thinks, mounts, finds, centres, base, Bases, matures, party, goes, charts, seeks, gets, sheds, reads, cuts, marks, favours, calls, lets, causes, wants, meets, cares, hails, makes, determines, creates, commends, provides, establish, praises, wins, develop, create, strengthen, strengthening. 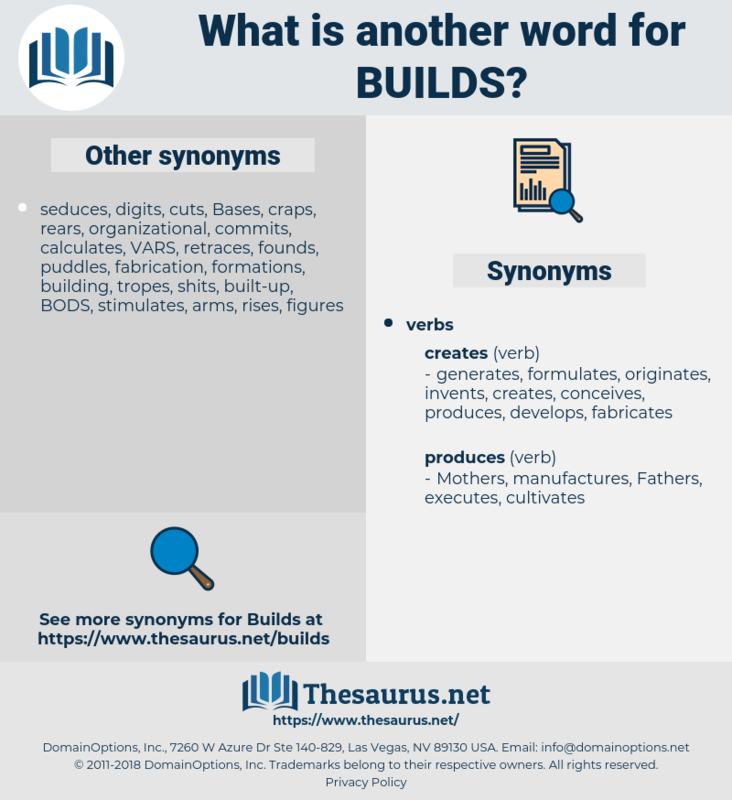 solidifies, delivers, reinforcing, implements, capitalizes, engenders, constructs, incorporate, incorporates, capitalises, integrates, maintains, ascertains, fosters, embeds, basis, acquires, relies, engages, extends, reinforces, identifies, achieves. As the island slowly sinks, the reef builds up with equal pace. 43 This example builds a list of all figures with class chart or class map.